Avery Nathens spent the last years of his training in General Surgery at Sunnybrook, and has a sense of belonging that stems from that period. "Sunnybrook is a very special place to me and gave me my interest in trauma. The move to Sunnybrook presented an opportunity to take the University's Trauma Program to the next level, to build on Robin Richards' work and to fulfill the academic mandate of the Hospital. I have a strong interest in safety and quality and the Centre for Patient Safety supported by the hospital, the University and the Hospital for Sick Children is well established at Sunnybrook. It is a great opportunity to develop this focus for the Department of Surgery. "Sunnybrook has a very strong research institute, with remarkable expertise in imaging. Imaging is so essential to guide our interventions that this provides a natural area for strong clinician-scientist collaboration. In fact, many have developed strong relationships with the imaging scientists to develop innovative strategies ranging from better treatment of brain tumors to facial reconstruction." "Sunnybrook is remarkably pro-active in developing partnerships, which fits my interest in systems of care. Eighteen months ago, while I was trauma director at St. Michael's, Homer Tien and I worked together in bringing our two institutions closer together, leveraging our great strengths - the transfusion work at Sunnybrook, and the scorecards and protocols at St. Michael's Hospital for example. We decided to build an integrated University of Toronto program of Trauma care. We managed to get support from the surgeons-in-chief and the hospital programs to obtain administrative support to coordinate our activities. Jim Wright then brought in The Hospital for Sick Children. Now the standards, quality assurance, and the safety protocols are uniform and well developed. They have been harmonized in a way that makes interaction with our external partners like EMS and Ornge much more productive. We have worked together to develop standardized inter-facility transfer protocols to better support referring emergency medicine physicians. We have developed a GTA Trauma Advisory Committee with members representing the LHINS, Toronto EMS, and the Emergency Medicine program to coordinate activities across the spectrum of care. We've also developed means to share data to improve the quality of care. Probably one of the greatest benefits is the move away from hospital-based fellowships to a "University of Toronto Trauma Program" fellowship, with trainees rotating between the trauma centres. We've recently held our first University of Toronto Trauma Conference at the BMO Institute with a focus on Mass Casualty Planning, which will be critical as we head into the Pan Am Games. Probably one of the more exciting areas in the program is our development of our website (http://surgery. utoronto.ca/programs/trauma.htm) and the University of Toronto trauma protocols. We have worked together to standardize our care and made our care protocols available on a mobile web site (m.trauma.utoronto.ca) and apps available on both Android and Apple platforms. To accomplish this, we used the expertise of our residents, Marisa Louridas, Matt Strickland, and Balisi Bakanisi, who we can't thank enough for moving this project forward. "Andy Smith has been a great support of this enterprise, which fits perfectly with the Department's new Strategic Plan, calling for greater integration across the centres. We have found that the key driver to program development was infrastructure support to provide consistency. It is very difficult to move a program forward when we are distracted by everyday crises. Having one individual moving the program forward from the administrative standpoint has been key. Tammy Kowalyk has been remarkably effective in this role, coordinating fellowships, developing the website and keeping her eye on the bigger picture. Avery's role models were Ori Rotstein, who guided his research and taught him how to give credit where credit is due, and to build on the strength of the students, and John Marshall. Both emphasized the axiom: "Do a few things well". "My advice to residents is: Do a few things very well and do the things that you love to do. When I was in Seattle at Harborivew Medical Center, there was a big focus on developing a bariatric program, an important and emerging field at that that time. It was also a potential revenue generator for the hospital. I made a decision to not dilute my focus away from trauma in spite of the pressures to do so. I counsel my residents and surgical scientists to do what interests them and avoid taking on activities that fill others' expectations or seen to be required by circumstance." Avery was a medical student at Queen's when he did an elective with Bob Mustard, who inspired him to go into surgery. "Bob is an extraordinary mentor. No patient was every too sick and no problem too difficult. I think of him as the MacGyver of surgery. (In a popular television series, MacGyver was the ingenious scientist who could solve complex problems using the simplest of materials.) Bob was an ingenious doctor with a higher calling. Bob went from mentor to one of my division members at St. Michael's, where over 20 years later, he continued to teach me about keeping patient's needs at the top of mind. Ron Maier was perhaps my greatest mentor from the trauma perspective. A chief of surgery at Harborivew and a world-renowned trauma surgeon, he taught me how to advocate for patients' out of the hospital environment. His focus on the macro-level of care was the inspiration for my interest in trauma systems. In systems, small tweaks can have a huge impact on the rates of injury, disability and death, far more than one can have in the care of a single patient. "Trauma surgery has evolved tremendously. Its heyday was during the days of the crack cocaine epidemic in the US, where there was a significant amount of penetrating trauma. As the epidemic disappeared, we began to care for more complex patients with blunt trauma, many of whom were older. Less operative trauma meant more time to focus on other aspects of emergency care. We already had a culture of taking care of any and all patients, regardless of insurance, regardless of the time of day, so our move into Acute Care Surgery was natural. It is also provided the opportunity to develop research programs that focus on relatively common understudied problems like appendicitis, cholecystitits, and diverticulitis. The model of care for acute care surgery also lends itself to an academic practice. When your "on", you have no elective surgery and no clinics, which means you are immediately available for quicker access to emergency care for patients and improved hospital flow. The weeks "off " provide ample opportunity for academic pursuits or administrative work." What has been the impact of trauma centres? "It is better to think of these as trauma systems. The systems are much more than a center - they involve every hospital within a region as well as transportation assets. Care in a trauma centre is associated with a 25% reduction in the risk of death and an improvement in functional outcomes. I have been fortunate to have the opportunity to direct the American College of Surgeons Quality Improvement program which benchmarks trauma care across trauma centres. This program has made it evident that there is wide spectrum of quality across trauma centres. What makes for a high performing centre is an intense area of study. The good news is that our performance in Toronto is on par with the very best in the United States." What are your graduate students studying? "All the students are working on projects related to either injury or emergency general surgery. We have a wide variety of collaborators in health systems, epidemiology, public health and geography, which makes every day a tremendous learning experience. " Is there an ethics component in your specialty work? "As an intensivist and trauma surgeon, I see such opportunities for improvement. Care at the end of life is often treated in a simplistic way: ‘inotropes – yes or no; intubate – yes or no'. We teach the menu, but the big picture focus is needed. I typically ask families to describe what their loved one was like before they became critically ill. What made them love life? What defined them as a person? These conversations become so important as we establish the goals of care for our sickest patients. It turns the conversation from an a la carte menu to a patient focus and families tend to be much more comfortable with their decisions. 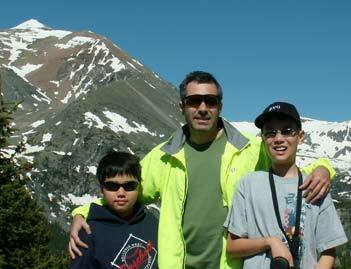 Avery enjoys travelling with his boys, Justin, 13 and Daniel, 16. He is an avid cyclist, hiker, runner and triathlete. He lives with Lisa in a recently renovated 1903 Victorian home in Cabbagetown, a great enclave in the middle of the city that is well known for its classic homes and vibrant cast of characters.